We’ve seen it before, with asbestos-related disease, leukaemia clusters and lung cancer caused by cigarettes. There tends to be a lag between the emergence of environmental risks and chemical injuries, and their recognition and therapeutic treatment by medicine and the law. 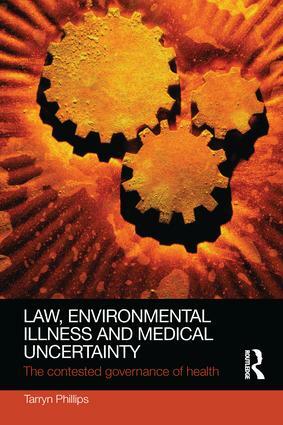 Law, Environmental Illness and Medical Uncertainty examines how our society governs new health concerns as they emerge, and the barriers that face new and uncertain theories seeking recognition in the law. In this book, Tarryn Phillips focuses her investigation on the struggle over the controversial condition multiple chemical sensitivities, or MCS (also known as environmental illness). Presenting nine case studies where workers sought compensation for MCS from their multinational employers, she captures a nuanced portrait of their embittered, unequal battles over the scientific, legal and insurance paradigms for understanding toxic risk, environmental illness and the regulation of industry. It draws on three years of fieldwork in Australia, including interview data with lay people and sympathetic and sceptical experts, participant observation in the courtroom and textual analysis of official reports. The book gives a unique, ethnographic insight into the governance of risk and uncertainty within a neoliberal economy, medico-scientific controversies and courtroom dramas. It highlights how a skeptical approach towards emergent environmental concerns is encouraged within the current regime, and decision-makers face disincentives for taking a sympathetic approach. Compellingly written and easy to read, it should appeal widely to interested lay people, and students and scholars of science and technology studies, medical anthropology, sociology of health and illness, and critical legal studies.